Flood Risk Floods are often associated with rivers and streams overrunning their banks, or with heavy rains from hurricanes and other major storms, and while those are very real hazards, the reality is that flooding can be caused by a number of factors that you may not have considered. One factor to consider when evaluating your risk of flooding is development and new construction in your area. A development project or new construction can drastically alter how the ground around the project is cleared of trees and other brush that help absorb ground water, or if the project has large paved areas, like parking lots, that could impact drainage and run-off. This could be true whether it’s a relatively small project like a new home being built next door to something much larger, like a shopping center which may be large enough to impact flood risk for an entire neighborhood. If you’re doing the “weekend warrior” thing and working on any major gardening or landscaping projects, keep in mind that you don’t want to inadvertently increase your flood risk. For hardscape surfaces such as patios and paths consider using semi-permeable materials such as flagstones or gravel that will allow ground water to drain, rather than collect (which it might if you were to pave these areas). Manage storm water and runoff by planting vegetation that can help absorb water, and try to avoid projects that would cause water to drain back towards your home. The reason it’s so important to be aware of these risks is that flood damage is specifically excluded by homeowners and renters insurance policies. Flood insurance coverage, though, is available through independent insurance agents as a separate policy from the National Flood Insurance Program (NFIP), a federal insurance mechanism. In the 1960s, taxpayers often had to “bail out” flood victims, and Congress created the NFIP to make flood insurance available in communities that adopted floodplain management laws to reduce flood damage. If you own or rent property in low- or moderate-risk flood areas, you can buy flood insurance, and may be eligible for a lower-cost preferred risk flood policy. 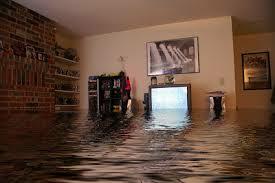 Unlike homeowners insurance, flood insurance typically has a waiting period. The NFIP sets a standard 30-day waiting period before flood coverage goes into effect, though it’s important to discuss this with your insurance agent to understand what the exceptions to the waiting period are and whether the waiting period would apply to your specific situation. If there’s new development in your neighborhood, it could impact your risk. A Lock Insurance independent insurance agent can help you sort out the coverage options, understand what the policy will and won’t cover and can help you get a policy through the NFIP.